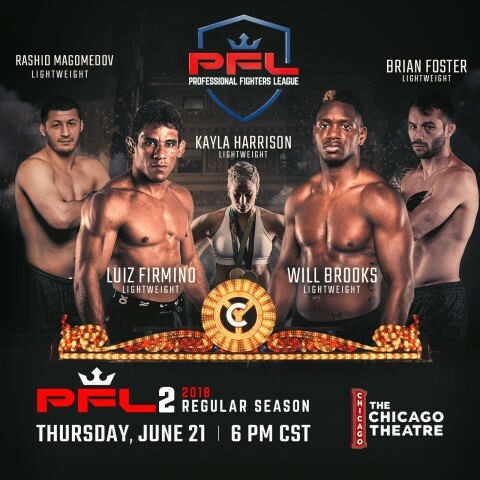 The Professional Fighters League (“PFL”) today announced the line-up for PFL2, which will take place live on Thursday, June 21 at The Chicago Theatre. PFL2 will feature individual fighters battling in the lightweight and light heavyweight divisions, competing to be the champion of their weight class and win over $1 million each. PFL2 tickets are on sale now. Talented lightweights Will Brooks—a Chicago native—and Luiz Firmino will compete at the top of PFL2’s Thursday Fight Night. The two fighters represent competing teams, with Brooks hailing from American Top Team and Firmino flying the Blackzilian standard. There is no love lost between the two gyms, located just miles apart in South Florida. PFL2 will also feature the first bout of pioneering American Judoka Kayla Harrison’s mixed martial arts career. The two-time Olympic gold medalist, and only American to ever win a gold medal in Judo, will make her debut against a Brittney Olinda-Elkin. Harrison’s fight will be a showcase bout and will not be part of the 2018 PFL season. Presale tickets for 25% off regular price can be purchased from Wednesday, May 2 at 10 a.m. E.T. until 10 a.m. ET on Friday, May 4, at PFLmma.com (presale code PRE25). Full-priced tickets will go on sale Friday, May 4 at 10 a.m. ET. Tickets can also be purchased at www.msg.com/the-chicago-theatre (presale code CHIPFL) and ticketmaster.com.